It's launch season and that means loads of paper contact cards! We all know that each paper contact card is someone who is interested in learning more about what you have available to them and ultimately deepening their relationship with God. This is a big deal! 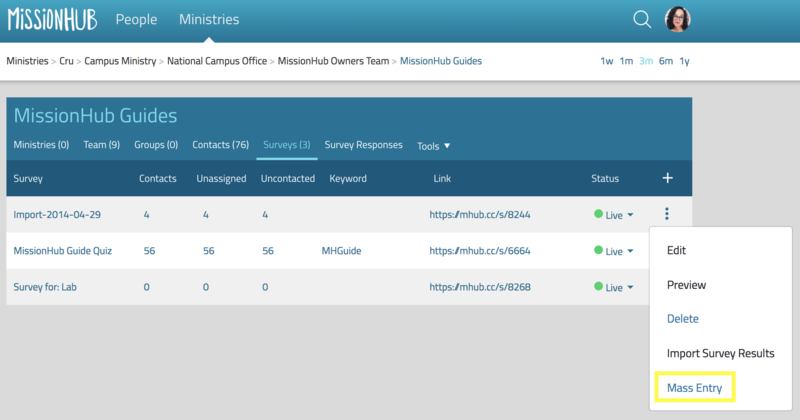 So, how do we get all those contact cards into MissionHub? The new and improved Mass Entry feature. This is a simple modal that allows your team members to enter their stack of 10, 20, 30, or 50+ contact cards at a time while enjoying pizza and time together. 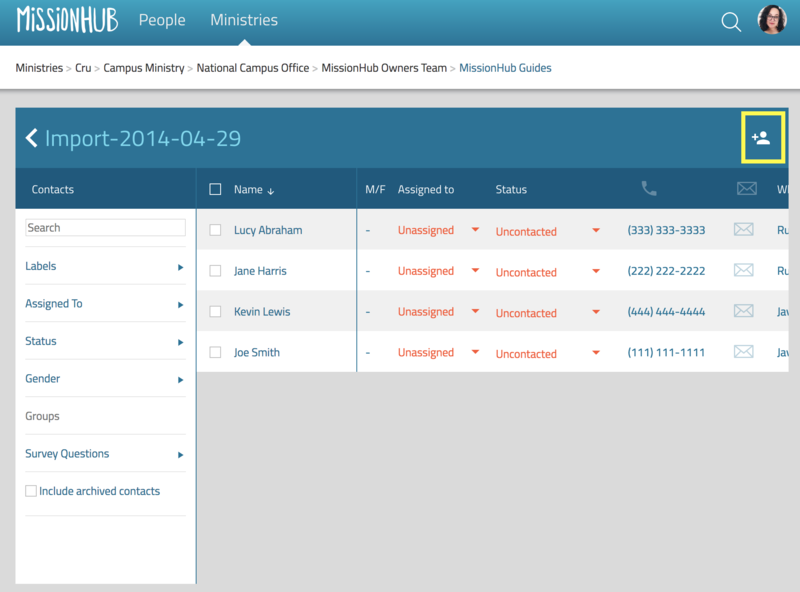 First, open MissionHub on web and select the campus movement you will be entering contact cards for. Next, select Surveys from the menu bar at this ministry and locate the specific survey. Then click the kabob menu (the three vertical dots to the very right of that survey). Click Mass Entry, and a model will pop up with those specific questions. You can add one contact or many! 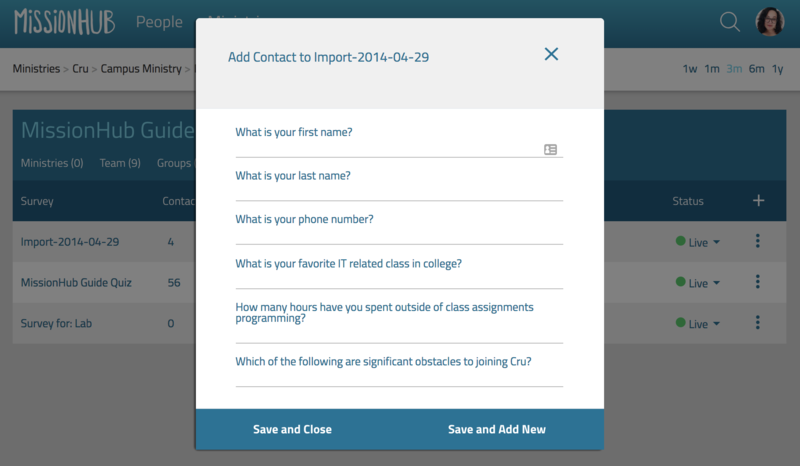 The second way you can access the Mass Entry feature is to use Survey Responses. Survey Responses scopes your contacts to the specific people that have taken or participated in completing this specific survey. Here we go! 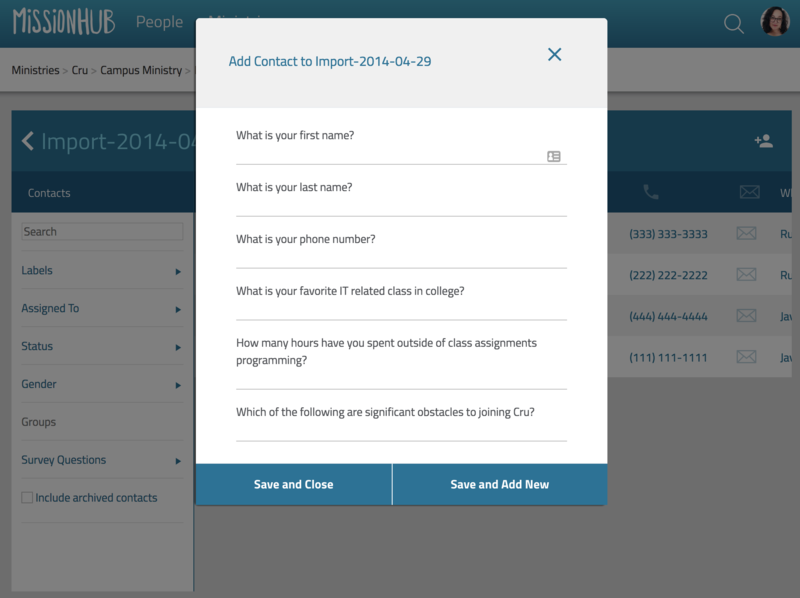 First, select Surveys Responses from the menu bar in this ministry and locate the specific survey. Here you'll see a quick snapshot of how many people have taken the survey (contacts tab), how many are still unassigned, and how are waiting to be contacted. Once you click the name of the survey, you'll see all the people who have taken the survey here as well as be able to filter using the left side column. To access the Mass Entry modal, click the add person icon in the top right corner. Mass Entry will allow you to enter one contact or many depending on what you need! NOTE: adding labels to Mass Entry is coming soon! Join us in prayer over our developers as they seek to serve you and your team!